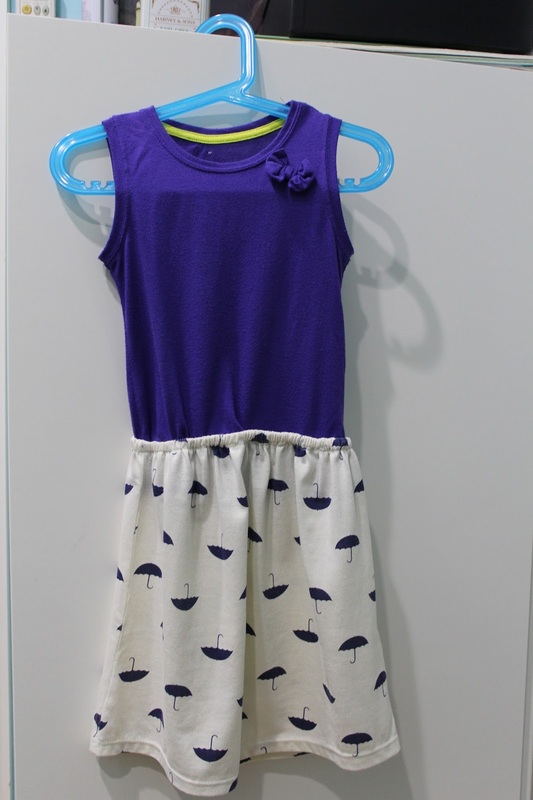 With great success converting the owl dress, I decided to do something to this brolly top that I have, but never worn. I wanted to convert it into a simple skirt for Kiddo to wear at home but in the end, I turned it into a dress. Step 1: Cut off the top of the singlet. Tip: fold top inside out and then fold the bottom towards the top. Use the bottom hem as a guide to cut. Using this method, the bottom hem of the singlet is left intact, therefore I do not need to worry about hemming up any raw edges. I used my scallop pinking shears for this coz the material curls like crazy when I use a pair of regular scissors. Step 2: Sew elastic band onto the newly cut edge. (This will serve as the waistband). Tug on the elastic band as you work the machine. After the elastic band has been securely sewn. Step 3: Use the secured elastic band as a guide and fold the edge inwards. Sew along the fold to achieve a neater waistband. Yup, in no time, the skirt was completed. Kiddo pulled out a blue top to match. 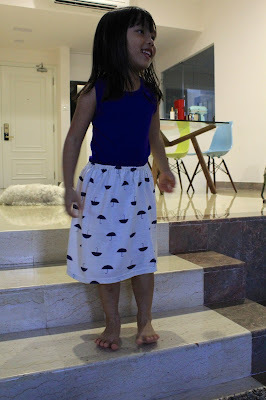 After seeing Kiddo pair the blue top with the skirt, I thought why not convert it into a full dress instead. Step 4: Draw a line across the bottom of the tee after deciding how long the bodice should be. Step 5: Fit the top into the waistband of the skirt. Step 6: Secure all around with pins. Make sure the side hems of the top matches the side hems of the skirt. Step 7: Sew along the wasitband of the skirt. Note: Keep checking to ensure that the excess portion of the tee remains flat and not caught as excess fabric by the machine. I suggest doing this kind of 'eyeballing' sewing only for kids' clothes coz we adults are way more particular about how the end product looks.